It could be argued that the brown trout requires little introduction in these days of supermarkets where it is displayed for sale. Most people will have met a hatchery-bred fish on the end of a fork. Intensive hatchery fish farming, however, should not be condemned. Anglers want to fish waters where there is a good head of quality fish and the restaurateur needs plate-sized trout for the table – the hatcheries supply them both. By selective breeding, and culling out the younger fish for the ‘table market’, the breeder produces fast growing, healthy fish for planting out as fingerlings or 6in yearlings. Fortunately the stocking authorities also like to plant a good supply of 8-1 Oin stock fish as well as a sprinkling of two- or three-pounders. All this keeps the fishery healthy and the angler happy. A single season in the wild turns these hatchery-bred fish into tough, hardy, flavoursome and sporting fish. The brown trout, Salmo trutta, is indigenous to Europe, North West Asia, and North Africa. It shows a remarkable diversity of shape and coloration, often according to locality. It can be categorized into two distinct forms which differ chiefly in life style but also in size and colour. The sea trout is the migratory form. Like the salmon it spends part of its life in the seay feeding well and putting on weight. It then returns to the river of its birth when ready to spawn. Once it has done so it drops back to the sea until next year. The brown trout is the non-migratory form which lives in rivers and lakes. The steeper gradients of the rivers where brown trout survive best are often a long way from the sea, and in many rivers they are separated from the sea by the slower sluggish zones which trout tend to avoid. Often mild pollution also bars the way to the sea. In any event the brown trout has been separated from the sea for many generations and has adopted an entirely freshwater mode of life. The migratory and non-migratory trout are the extreme forms in terms of habit and appearance but there are several distinctive variations which appeal- in particular locations. These were indeed once considered to be separate and distinct species, or at least sub-species, and were even given scientific names to distinguish their specific status. More recently these fish have been shown to produce fertile progeny, and they are now regarded as variable members of the same species, now known throughout its indigenous range as Salmo trutta. Nevertheless local pride runs high, and the local names persist. Anglers anxious to sample the sporting qualities of these variations will not be disappointed by the Gilaroo trout of the Irish loughs, nor the Loch Leven or Orkney trout of their respective localities. Where the water has not been ruined by pollution, abstraction, sewerage or canalization, brown trout are to be found in most river systems. 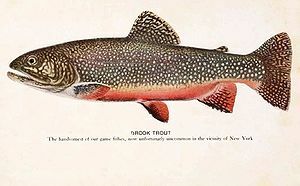 They live in the swifter steep gradients where rocky, gravelly or stony bottoms and the swift flow produce the high oxygen re-quirements of the trout, and provide the kind of spawning facilities upon which their future stocks depend. 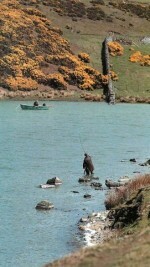 The slower, sluggish, muddy-bottomed reaches inhabited by coarse fishes are not favoured by trout although the coarse fish angler seeking roach or bream will occasionally take a trout on his worm. Trout are very much at home in the typical moorland stream or the rocky beck as well as in the traditional chalk streams of southern England. They also do well in lakes and ponds where the conditions are suitable. The intensive reservoir building programme that has taken place in Britain during the post-war years, however, has led to a total redistribution of the species. Many fine new waters have appeared in regions such as the South East and the Midlands. Most of these new waters have been extensively stocked with trout, and good trout fishing is now probably cheaper and available to more people than it has ever been. Waters rich in calcium produce prolific weed growth, and this in turn stimulates the growth of numerous insect, mollusc and crustacean stocks. In such waters the generous food supplies favour big, fast-growing fish. Blagdon and Chew reservoirs are good examples and the angler confidently expects to take fish between 2lb and 3lb. With luck he hopes to get the odd four or five-pounder. If he is especially favoured, and suitably skilled, he may net a fish over 6lb or 7lb. The chalk streams of the South also produce excellent fish. The Avon, Kennet, Test and Lambourne rivers are typical examples. In Ireland, Lough Inchiquin and Lough Rea are well known for their high quality of fish. At the other extreme the tiny becks and streams of some northern and western districts produce small, mature, but game and crafty trout up to 8in long. Owing to wise stocking policies most reservoirs in southern England will provide anglers with average fish of about a pound. The occasional two or three pounder will be taken, and once or twice in a season a four-pounder will be recorded in the book. This is good trout fishing by any standards. A bonus for the trout fisherman has been the introduction, alongside the native brown trout, of the American rainbow trout into most stillwaters. In more recent years many reservoirs have also been stocked with the America brook trout Salvelinus fontinalis, which is not a true trout, but a char. This makes a further bonus for the brown trout fishermen, particularly since like the rainbow, it seems to be a very ready riser on occasions when the browns are sometimes dour. Fears are sometimes expressed that these very hardy and tough fighting introductions might swamp the native brown trout, but as both brook and rainbow trout rarely breed successfully in the great majority of British waters their presence depends largely on continuous re-stocking, whilst the brown, breeding naturally, maintains itself in most waters. Experience to date suggests that the brown trout is more than holding its own. Brown trout spawn at somewhere between two and four years of age. The eggs vary a great deal not only in size, but also in their incubation period. Research indicates that the time varies according to water temperature. It ranges from 21 weeks at 2°C (36°F) to four weeks at 12°C (54°F). Losses are staggering during this incubation period, and during the first year of life. Estimates vary, but the general view is that of 10,000 eggs produced only about 250 fish survive to the end of the first year. Growth rates vary too. A year-old fish may be between lin and 5in long, a two-year-old between 4in and 9in, and a three-year-old between 6in and 13in. Hatchery fish have been recorded surviving to 12 years old, but the general run of fish is estimated to live to four or five years before it dies naturally, or is caught. Fortunately for the angler the feeding habits of trout do not differ as widely as their growth rates, incubation periods, and maturation ages. Most trout, wherever they live, obtain most of their food from or near the bottom. They certainly supplement this staple . diet with water-borne flies and insect living in or on the surface, or alighting temporarily upon it. They are not fussy about what they eat when hungry and will snap up almost anything which moves, providing they can manage to swallow it. They can be extremely fussy when food supplies are plentiful, and then the angler is hard put to please them. In rivers the fish tend to select a ‘lie’ which becomes their territorial base. It usually offers a haven from predators, and is protected from the full force of the current. They have their own territory around this base, and forage freely within it. The stream brings along food supplies regularly, and they probably feed rather more on the surface than their reservoir counterparts. Such a fish will defend its territory from intruders, and each fish in a particular reach knows its own place in the hierarchy or pecking order. If the big fellow succumbs to the angler his place will not be empty for long. The next in succession will occupy it, with others moving up in the queue. Anglers generally know such spots in their own river, and have the advantage that they can often stalk a known fish in a known place. The disadvantage is often the very clear nature of the stream, which discloses any careless move to the fish, and ‘puts him down’. The reservoir angler often has the advantage of somewhat coloured water, and a profusion of bankside weed and vegetation. His fish rise less often, but nevertheless patrol their territories, usually giving away their rising spots. Their territories are larger, and may be vacated from time to time as the fish cruise up the wind lanes, or around the margins, in their search for food. Although trout can be taken on many baits, including the lowly maggot, worm, spinners and lures, the artificial fly is the offering most used to attract this game fish. sweep backwards and it is fished below the surface. Wet flies and dry flies come in hundreds of different dressings and the number is added to every season. Some flies represent nothing more than the fly tier’s whim and fancy – but they catch trout. Other flies represent small fish, insects and their larvae, spiders and freshwater shrimps. Many of these imaginative wet flies, such as the lures, look like nothing the fish is ever likely to see in the wild, yet still take fish when fished deep, or in mid-water. Paradoxically, the Muddler type flies too are often very successful on the surface, either floating still, or when retrieved very fast and producing a bow wave that by rights should put the fish down. All this merely goes to show that the brown trout will eat almost anything when he’s in the mood, and can often be conned into feeding, even when he isn’t hungry.